Looking for a Missguided student discount? Confused about how much students can save? We can help. Firstly there is an official Missguided student discount. 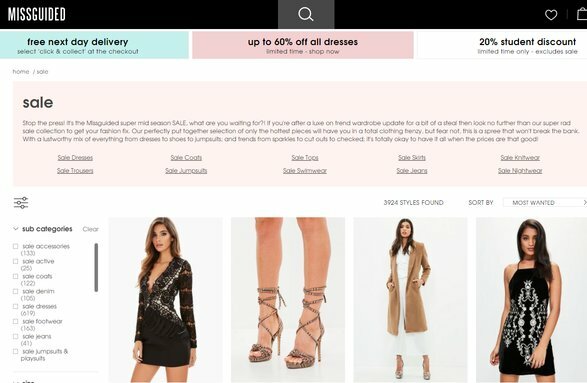 It is currently 20% off everything (excluding sale) and you can get it by heading to this special page on missguided.com. At the moment it’s also possible to get 20% off sitewide with a special promo code. Make sure you check out the sale page too with discounts of up to 50%. Is there a Missguided NUS, Unidays or Student Beans Discount? Missguided has a huge range of womens fashion on it’s website missguided.co.uk. From affordable, stunning dresses to body suites, coats and jackets, tops and jeans they truly have it all. And with a Missguided student discount courtesay of Unidays, there is also ways to save money too. Aimed at women aged 16-35, Missguided was launched in 2009 but has experienced such rapid growth that it now stocks thousands of items with hundreds added daily, as well as operations in the US, Australia, France and Germany. The brand is known as the ideal one-stop-shop for effortless outfits and is a favourite amongst bloggers and influencers, so their pieces can often be found shared and styled on social media by a range of women spanning all backgrounds, shapes and sizes. A bold and straight talking brand that manages to always come across a ‘girl’s fashion-forward best friend’, Missguided says its aim is to empower females globally to be confident in themselves and to be who they want to be. All of their looks are created in-house by their own designers and the economies of scale they’re now able to work with helps them keep costs down and items affordable. Led by the Babes of Missguided, as they call their fans, the community of the firm’s fans celebrate each other and their aesthetics. Some influencers and celebrities are given their own discount codes to promote and can even earn commission on certain items bought through the site. The current Missguided range includes dresses, tops, trousers, skirts, blazers, jackets, coats, activewear, lingerie, accessories and shoes. The brand launched its first wedding dress collection last year, and also plays host to fantastic ranges of clothing for petite, tall and plus sized women. Everything can be returned for free so you can try before you really buy, and with a 30% standard student discount, there’s bargains to be bagged! Of course, if there’s any extra offers, discount codes or sales to be had, this is the place to hear about them – so bookmark Student Discount Squirrel and we’ll keep you updated on developments. Missguided are well known for hosting quick flash sales, and we have the inside info on them: so never shop without checking back here first! Missguided is known for its forward-thinking collaborative collections, and most recently these have included working with Amber Rose, Jourdan Dunn, Carli Bybel, Caroline Receveur, Sarah Ashcroft and Alexis Ren. They continue to work with the hottest and most relevant of women worldwide, so stay tuned for them launching something with someone you love soon. Missguided was created back in 2009 by Nisin Patti, who studied business management at Cranleigh School and Newcastle University before working for his father’s fashion wholesaler after graduation. Taking a £50k loan from his father, he used £3k to set up the website and £5k to buy stock – and had repaid his Dad within 6 months! His inspiration came from spotting a ‘gap’ in the online market aimed at fashion for younger women; so he took a punt, and it paid off. Now, Nissin is a multi-millionaire as a result of owning Missguided and remains the sole owner. Missguided’s success is thought to be having cashed in on the fast fashion revolution just as it kicked off, as well as having capitalised successfully on social media attention using strategic partnerships with bloggers and influencers. The brand’s outfits are often shared, liked and commented on online, and developments in social media platforms mean that fans are able to shop directly from their social media feeds. What’s more, you can now find Missguided gift sets in Boots during their classic Christmas 3-4-2 range and in selected department stores nationwide – so you can have it bought for you, too. In 2017, the firm opened its first bricks-and-mortar stores in Bluewater and Westfield Stratford shopping centres, but it has since confirmed that the latter is to close, raising questions as to the ongoing financial viability of taking such a large online operation offline and onto the high street. That says, popularity remains high, and the site is still a firm fashion favourite for many. For fun fashion and great prices Boohoo is the one to go to. And they have a student discount available to. Click here to see. Miss Selfridge has stores on the UK highstreet, a student discount programme and some killer fashion choices at university friendly prices. Dorothy Perkins is another clothing stalwart with an impressive UK-wide coverage. And with a student discount you can look great for less. TK Maxx needs no introduction… great offers and discounts all year round, check them out today. Prettylittlething – we love them, stylish, great prices year round – check them out today!